Both Casino and Harry Casino have added two more Williams Interactive slots today. First there is Giant’s Gold using the popular colossal reels, just like Kiss and Spartacus. But there is a difference. When a wild symbol appears fully stacked on the smaller reel set, it is transferred to the colossal reels. 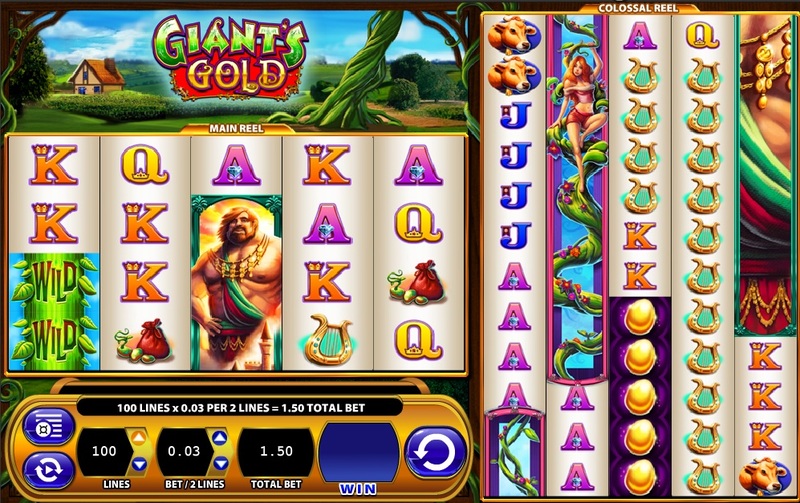 And if you get at least three reels with bonus symbols you are awarded with up to 100 free games, where all winnings on the colossal reels are doubled. By the way, the bonus game has a very fun song, “Fee-fi-fo-fum”. Second slot game is Super Jackpot Block Party. Which is the follow-up on the classic Super Jackpot Party slot. This slot has a very fun bonus game where you open presents, just like the classic game. But this time you can open up to 4 different parties, together. So opening up 4 bonuses together. I have added two YouTube clips from both slots, just to get an impression. As mentioned above, both games are now available at Harry Casino and CasinoEuro. Which both offer a lot more amazing WMS Gaming slots.